In this day and age, computers, smartphones and similar technologies are everywhere. 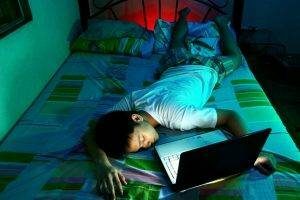 Many hours are spent by most of us, either during our leisure time or for work, looking at the lighted screen of a computer or smartphone. Recently, the incidence of Computer Eye Strain has gone up significantly. As much as 90 percent of all people who consistently work with computers suffer from eye strain and other symptoms. These symptoms often lead to physical fatigue, decreased productivity and increased work errors. Minor annoyances, such as eye twitching and red eyes, have also been reported. Move your workspace around a bit. With a bit of rearrangement, a new workspace configuration can help your eyes more easily deal with strain associated with working all day on the computer. First, attempt to minimize the impact of light coming in from outside by simply closing the shades. Also, if possible, place your computer screen with windows to the outside off to the side, rather than behind or in front of it. This reduces strain on your eyes from bright sunlight that streams in through the window and may cause your eyes discomfort. Finally, regular eye exams are absolutely essential. This is true no matter what eye condition is being treated or prevented. Those who work most of their days on the computer should have an eye exam before they start working, and every year after that, so that their eye doctor can keep track of changes, and treat symptoms as they are diagnosed. “Also, speak to your eye doctor about custom 'computer glasses' to help deal with computer eye strain,” notes Dr. Mackey.